We are proud to announce that we are now an Authorized Big Green Egg seller and we have a full line of the Big Green Egg brand’s charcoal grills. At Capps Home Building Center, we know how much our clients love to grill out, which is why we stay dedicated to offering only the best grilling brands and accessories. For starters, the Big Green Egg is one of the most replicated, but never duplicated, cooking grills. 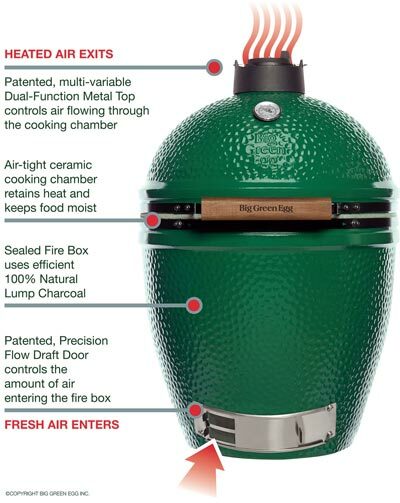 The official Big Green Egg was developed based on the design of ancient Chinese and Japanese clay cooking vessels. The owner and founder of the grill, Ed Fisher, recognized these ancient cooking methods while overseas in the late 70’s. To his surprise, the food cooked in them tasted far better than food cooked in traditional charcoal or gas grills so he brought the idea back with him to the United States. From Ed Fisher’s original model, the Big Green Egg product line has grown to include seven sizes of the EGG, and hundreds of accessories and related products designed to always make Big Green Egg a cooking experience that is entertaining an fun! Now, millions around the globe use his grill to cook up tasty meals. The Big Green Egg is also widely known for the near endless selection of accessories it comes with. Fortunately, here at Capps we carry those too! Our selection of Big Green Egg products includes their full-line of charcoal grills (available in a variety of sizes) and dozens of ‘eggcessories’ and related products like grilling tools, baking stones, charcoal, starters, racks, and grids. Specialty cookware like the Egg pizza stones, seasonings and spices are also included in our selection of products. You don’t have to travel to Roanoke or Lynchburg to enjoy serious “kamado-style” cooking with the top brand in its class. Visit our store and we’ll help you customize your grilling experience by adding the Big Green Egg and its egg-cessories to your backyard. You’ll also get the same level of quality customer service you’ve come to expect from Capps. You’ll also enjoy earning Capps Rewards Points with all your Egg purchases!